In January 2005, some remarkable things happened on the Sun, and the implications are still reverberating through the scientific community. 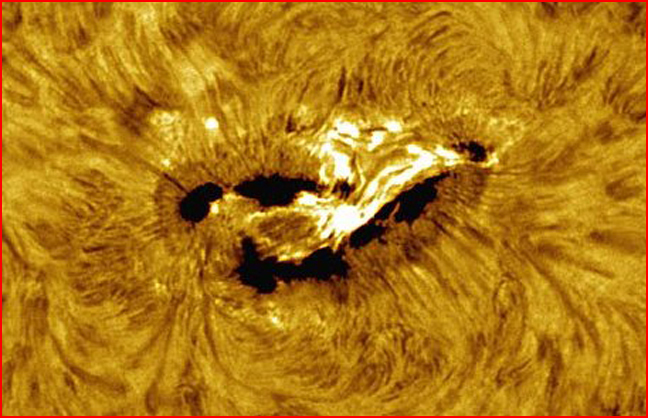 Between January 15th and 19th four powerful solar flares erupted from “sunspot 720,” shown in the picture above. Then on January 20 the fifth explosion produced a coronal mass ejection (CME) that achieved velocities incomparably greater than anything astronomers had seen before. While it often takes more than 24 hours for the charged particles of a solar outburst to reach the Earth, this one was a profound exception. Just thirty minutes after the explosion, Earth (some 96 million miles from the Sun) was immersed in what NASA scientists called “the most intense proton storm in decades.” Proton storms get their name from the “rain” of positively charged particles when a mass ejection reaches the Earth. Powerful ejections can throw off a billion tons of solar material. Normally they travel relatively slowly. “Even the fastest ones, traveling one to two thousand km/s, take a day or so to reach Earth. You know a CME has just arrived when you see auroras in the sky”. But this space weather theory is “soon to be revised”, the story says. Here’s why: Though the speeds of typical CMEs are impressive, and have posed a deep mystery for decades, they do not come close to the speed of the January 20 ejection. Light from the Sun (or from a solar flare) reaches Earth in 8 minutes. An ejection reaching Earth in 30 minutes must be rapidly accelerated to velocities more than a quarter of the speed of light. From the traditional viewpoint, this is unthinkable. And yet it happened. 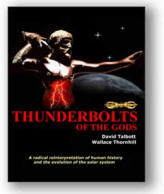 How, then, do theorists of the Electric Universe see all of this? Most are amused by the commotion. In the universe now observed with better and more versatile instruments, we see plasma jets and ejected material often attaining velocities approaching the speed of light. In electrical terms, the explanation is direct and obvious: electric fields in space accelerate charged particles. On this electrical principle there is no debate. But by banishing electric fields from their theoretical models, astronomers and astrophysicists are left with no mechanism to account for the things they now see. One after another, the ad hoc guesses must be abandoned. The electrical theorists accept the observed facts concerning CMEs, but they consider the astronomer’s theoretical framework to be a decades-long disaster. It is neither sufficient nor accurate to describe sunspots as “places where strong magnetic fields poke through the surface of the Sun”. Such a claim fails to account for the magnetic fields themselves and leaves the associated sunspot events unexplained. When the NASA story says that the magnetic fields “become unstable and explode, unleashing as much energy as 10 billion hydrogen bombs”, it adds that “no one completely understands” how this occurs. The authors of the news release are clearly not familiar with electrical discharge in plasma, a phenomenon outlined in great detail by Nobel Laureate Hannes Alfvén, the founder of plasma cosmology. Alfven’s contributions were rooted in direct observation of plasma discharge in the laboratory. He described how the insulating layers of the cellular structures that form in electrified plasma often break down, causing instabilities. Such instabilities are typified by the energetic explosions we see above sunspots. Though the article accurately describes the “highway” taken by the charged particles, it concludes, “How they were accelerated, however, remains a mystery”. It’s a mystery only to them. Neither Lin nor the article’s author is familiar with the “field aligned currents” documented by Alfvén. By following the direction of the induced magnetic fields, electric currents move efficiently, like transmission lines, across the vast distances of interplanetary, interstellar, and intergalactic space. The quarter-light-speed CME of January 20 is not just an isolated exception to the “normal” solar wind. It demonstrates that the “normal” explanation for the solar wind is mistaken and unable to account for the extremes of solar wind behavior. (On some occasions, the wind had stopped—an event just as unexplainable by standard theory as the January 20 event.) The electrical acceleration of plasma accounts for the entire range of wind behavior. (Thanks to Michael Armstrong for much of the factual content in this Picture of the Day).